1. Wash and chop tinduras lengthwise. Peel and chop potatoes lengthwise. Peel the cashews and halve them and keep it aside as shown in image-1. 4. Every so often, check if the upkari is well cooked. Change water if it has started vapourising and if the vegetables are yet uncooked. When done garnish with freshly grated coconut. 1. 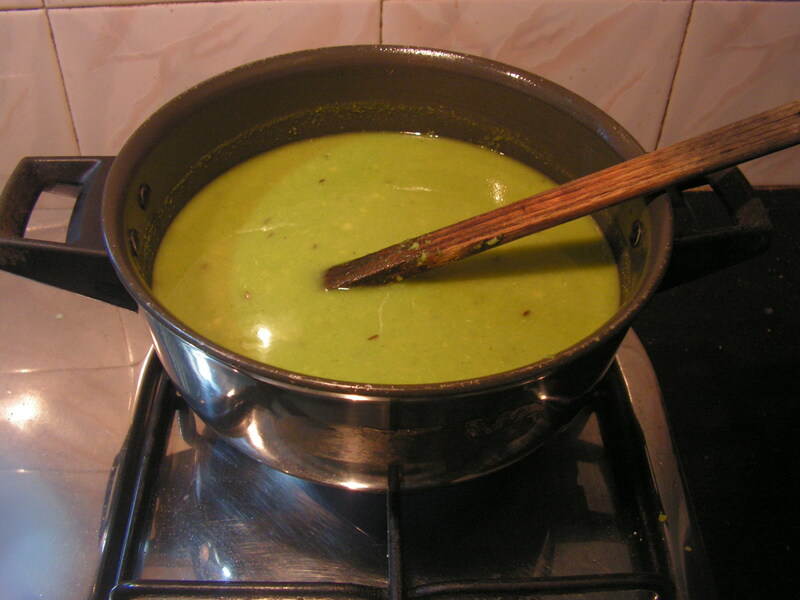 Tender tindura/thendle/ ivy gourd is ideal for this dish. If ripe thendle are used the dish will turn tangy. I have used tender Ivy gourd from my garden. 2. If tender cashews are not available – soak the dried cashews with in water over night, and use the peeled cashews next day to obtain the same flavour. 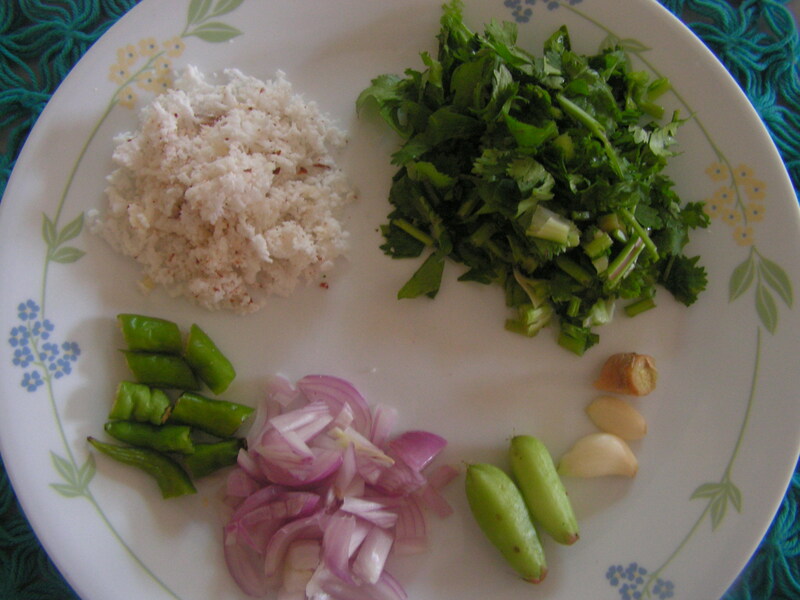 This entry was posted in Uncategorized and tagged 45 minutes, Konkani dishes, Lunch side dish. In Manipal, fresh mushrooms are available only during the monsoons, and I associate them with heavy rains, thunder and lightning ! One could complain that the frozen mushrooms in supermarkets do not have the same taste as the fresh ones – but then I also graciously accept that supermarkets have made mushrooms available all year round. Not everyone likes mushrooms, but those that do use them in a variety of dishes derived from different cuisines. I have already put up button mushroom masala, mushroom masala, mushroom-almond rice and I would like to share this recipe for a Konkani classic – alambe ambat. 1. Wash and finely chop chop Mangalore Cucumber and tomatoes, fine. Also wash, peel and chop onions and keep aside. Cook all of them including chopped mushroom in the cooker adding a little water, turmeric powder and also salt so that it is not over cooked. 2. Place a spatula with a teaspoon of cooking oil in it on low flame and fry red chillies in it till done. 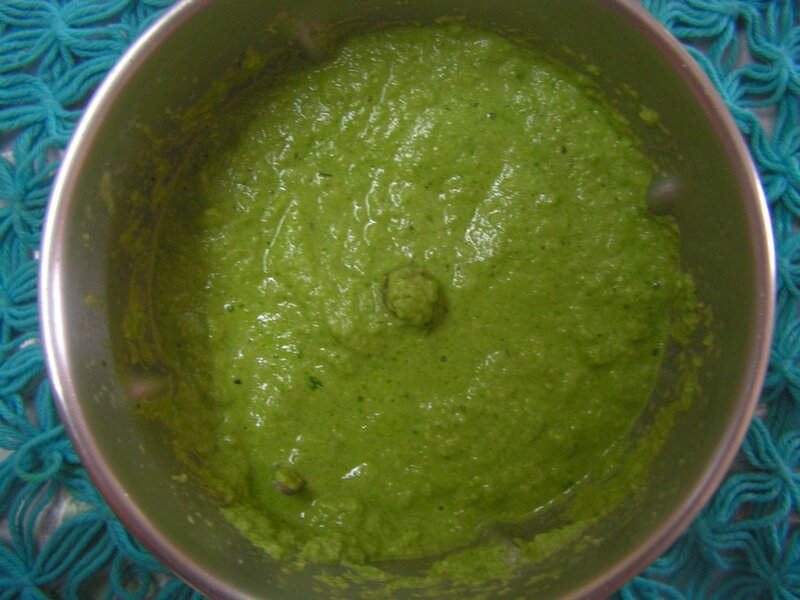 Grind the ingredients of wet masala in the mixer adding water in steps to a fine consistency. 3. Transfer the cooked veggies from the cooker to a wide bowl and add the ground masala to it and bring it to boil adding required quantity of salt. (Remember – we have already added salt; hence check before you add. 4. Finally chop a small onion finely and fry in a spatula with a little oil till light brown and season/garnish the dish. Enjoy with either rice or even roti or chapati. Everyone in my family will say – yummmmmmmmmmmm ! 1. Mangalore cucumbers partner with mushrooms perfectly and gives a unique taste. 2. This ambat does not use any dal. This entry was posted in Uncategorized and tagged 45 minutes, Konkani dishes, Lunch side dish, Mushroom dishes, Side dish for Rotis. 1. Wash and wipe okra with a clean cloth and cut into bite size pieces and keep aside as shown in image-1. 2. Wash and cook toor dal in the cooker for about 20 minutes / till smooth. 3. Place a skillet with 2-3 Teaspoons of cooking oil in it on medium flame. When hot, add jeera/cumin seeds to it. When they start spluttering, add mustard seeds. One they’re spluttered, add hing/asafoetida powder, red chillies and curry leaves to it. When well-fried, add chopped tomato and fry till mushy on low flame. 4. When tomatoes are fried, add chopped Okra from step-1 to it adding required quantity of salt to the dish. Fry it in the seasoning and close the dish with a lid – check at regular intervals. 5. When okra pieces are cooked well, add the cooked Toor dal from step-2 to it and stir well with a wooden spatula so that cooked okra pieces are not crushed. 6. Add sambar powder, and required quantity of water to bring it to required consistency. Also, check for salt and bring the sambar to boil; stir with a wooden spatula only. 7. Finally garnish it with chopped coriander leaves. Enjoy with white rice. Really yummmmmm. 1. Okra should be tender and fresh. 2. 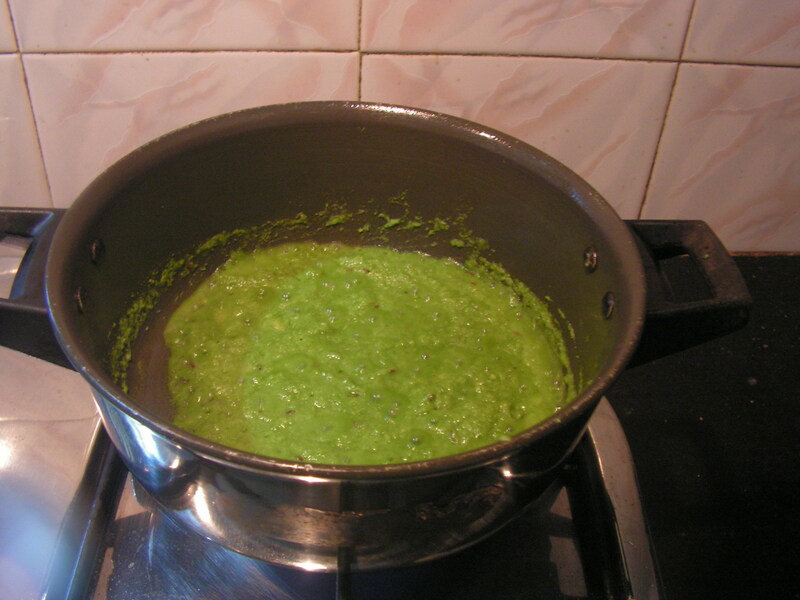 Sambar powder of one’s choice can be used, use quantity according to your taste. 3. Using of wooden spatula is to avoid cooked okra from turning soggy. 4. One can even use tamarind paste in place of soft tamarind. This entry was posted in Uncategorized and tagged 45 minutes, Lunch side dish. 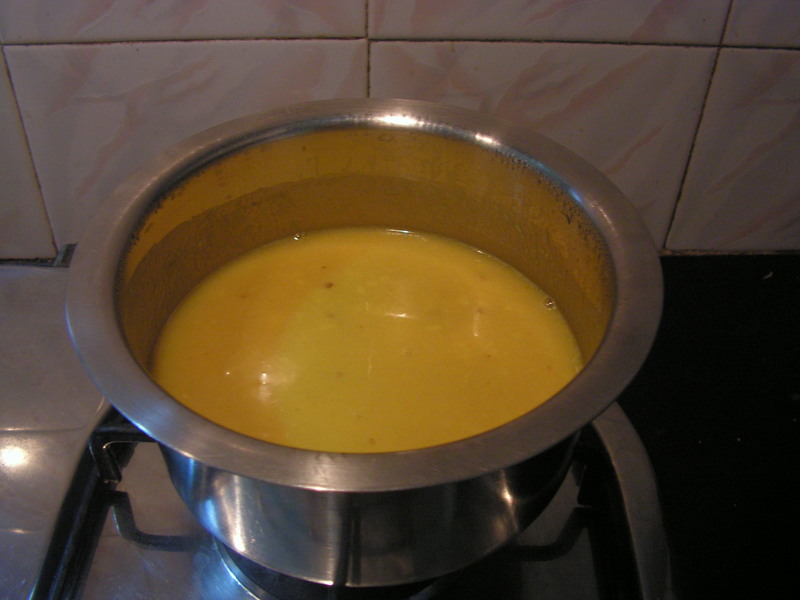 Dal and Sambar in any Indian culture is almost always made from toor dal in their simplest forms. Indeed, toridali (Konkani) / thogribele (Kannada) is the quintessential ingredient found in all Indian kitchens. Today, I want to share a different style of dal that is made in combination with moongdal. This masala dal is unique in its taste and mixes well with rice and papad or any side dish of your choice. 1. Wash and cook together the toor dal and moong dal, adding turmeric powder in the cooker, till smooth and transfer it to a bowl. 2. Grind all the ingredients of wet masala in the mixer to a fine consistency, adding a little water as required. 4. When done add cooked dal mix from step-1 and add required quantity of water to bring it to the required consistency. Also, add salt to it. 5. Transfer it to a bowl and serve hot with white rice and papad. Enjoy ! 1. Both dals should be cooked well to enhance and enjoy the flavour and taste of the mix. 2. Quantity of onions, garlic and spices can be adjusted as per your palate. 3. 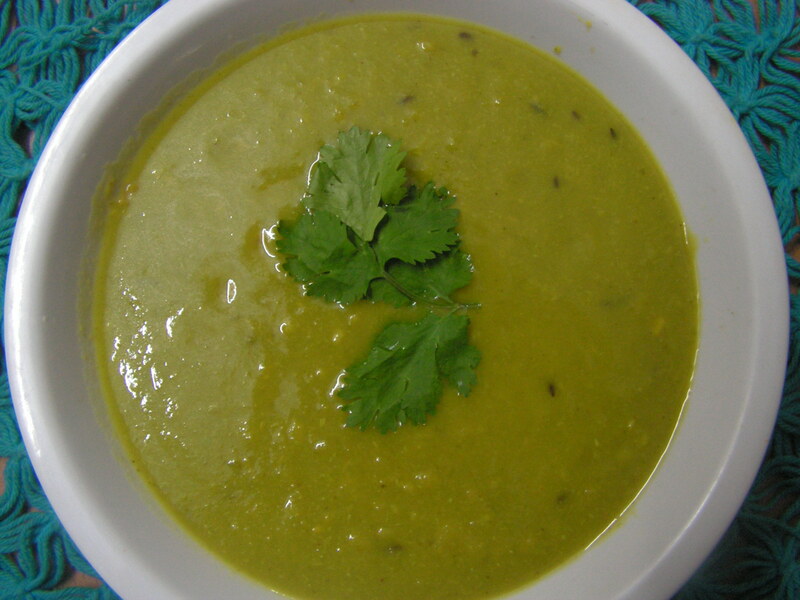 This dal can also be served for children – adjust the spice level accordingly. This entry was posted in Uncategorized and tagged 45 minutes, Dals, Lunch side dish.